Jordan Hall was the scene this past Friday for the Celebrity Series recital debut of celebrated opera baritone Nathan Gunn with his wife, pianist Julie Jordan Gunn. 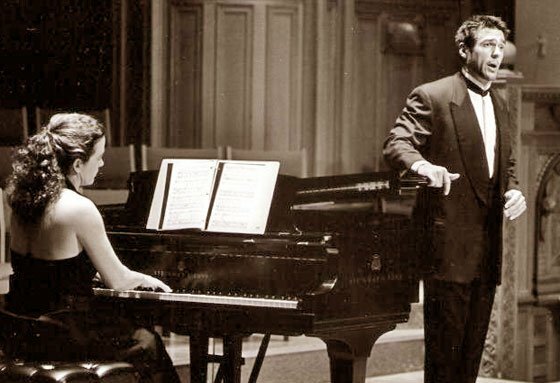 A variant on a program the two have given multiple times over the years, it consisted of a set of Schubert Lieder, the Dichterliebe of Robert Schumann, then songs of Samuel Barber, Charles Ives, and William Bolcom. The results of the opera singer playing an art song performer came unevenly to this listener’s sensibilities. Early arrivers to Jordan Hall got a foretaste of the evening’s problems, as programs and song texts were unavailable and frazzled staffers noted on walkie-talkies that the songs would be announced from the stage if necessary. Then, a few minutes before 8 p.m., ushers distributed programs which had arrived at the last minute, and which proved to be riddled with mistakes, omissions, unset texts and typographical errors, even though the couple had done this exact program in Berkeley California a week ago. The Gunns began with one of Schubert’s last songs, “Die Taubenpost,” the final song of Schwanengesang, to a text by Johann Seidl. In this cheerful song, of a carrier pigeon carrying messages of love’s constancy, one could hear a microcosm of the things that went well, and the things that could have gone better in this program. Mr. Gunn’s lyric baritone voice is an enviable instrument, with a dark, creamy color, and impressively consistent in tone through a two-octave range, from the quietest falsetto pianissimos to the loudest fortes. His enunciation was impeccable, with crisply delivered consonants and clear vowels, though the lower parts of the bass register are a challenge for any singer to deliver clearly. But the expressive range seemed somehow constricted, as though his tuxedo and the solo presentation without costumes or other characters to react to, forced him to jettison his gifts for characterization. There were some inflections to the text, most notably a nice dynamic pull back near the end of the song, but the seven stanzas of “Taubenpost” were delivered with a sameness that failed to engage. At the piano, Mrs. Gunn played capably, swaying her body back and forth to the shape of the phrases, but played literally and figuratively on short stick, mostly deferring to her star husband, watching him like a hawk while he seemed to pay little mind to her. Neither provided that variation in response to text that enlivens Lieder. “Das Rosenband,” to a text by Klopstock, is a pleasant, inoffensive early song that was delivered with a tone not much different from “Taubenpost.” “Im Walde,” a Schlegel setting filled with the rustling unease of the Romantic forest, brought out more interesting coloring, thicker piano textures with rumbling bass, and Mr. Gunn responded with a wider ranging performance with satisfying low notes to sound out the words, “Tief in kühler Waldesnacht.” “Nachtviolen,” a Mayrhofer setting, is a relatively simple song that could convince with the Gunns’ artless delivery. “Auf der Bruck” sets a text by Ernst Schulze, and ably captures a horse spurred by the poet, riding furiously to the lover who is equally source of bliss and pain. The stormy setting again seemed to appeal to Mr. Gunn’s operatic bent and made for a compelling close to the Schubert set. But not enough was done to bring out the weirdness in Dichterliebe. The opening song, “Im wunderschönen Monat Mai,” which describes the awakening of spring, of love and longing, was taken at a glacially slow tempo, and while Schumann’s expressive fluctuations of tempo were observed, the second stanza was delivered in exactly the same way as the first. “Ich grolle nicht,” a song often excerpted in recital because of its gradual build to a satisfying climax, showed none of the poem’s odd mix of fury and pity for the lost beloved, driving instead for the crowd-pleasing high note (which Schumann didn’t actually write). “Ich hab’ im Traum geweinet” is one of the oddest Schumann songs. Look at the score here, and you’ll see an awful lot of blank space—voice without piano, piano without voice, and uncomfortably long stretches of silence. Observe the silence for the marked number of beats, and the song becomes a Gothic nightmare. But the Gunns ran straight through this song omitting the silences entirely, and this matter-of-fact delivery comes off flat. The whimsy of “Aus alten Märchen” (From old fairy tales) was nowhere to be seen, and in the long playout to the final song, “Die alten, bösen Lieder,” Mr. Gunn seemed to disengage from the performance as Mrs. Gunn brought the cycle to its conclusion. After the intermission, the couple returned for three sets of American songs. On the whole, the second half came across more convincingly, though it too had its uneven points. “With rue my heart is laden,” with a text from Housman’s A Shropshire Lad, “Nocturne,” setting a text from Prokosch’s The Carnival, and “Sure on this Shining Night” to a text by James Agee were all delivered agreeably, artlessly, unmemorably. It was with the James Joyce setting, “I hear an army,” where the strident, aggressive military tone seemed again to bring out a more compelling sound from both baritone and pianist. Mrs. Gunn introduced the Charles Ives set with brief spoken remarks. “The Circus Band” was one of the better performances of the evening, with Mr. Gunn doing a charming job portraying the wide-eyed adolescent excited to see the circus coming to town, and varying his delivery to comic effect when the text and music repeated. “Down East,” “Tom Sails Away,” and “An Old Flame” all evoke past memories, scenes of childhood, and visions of long lost loves. The artless delivery worked effectively for these more lilting tunes. “General William Booth’s Entrance into Heaven” is another story. In the best of hands, this song is a four and a half minute tone poem for piano and obbligato singer, using densely complicated music to evoke the transfiguration of the founder of the Salvation Army, leading a grotesque band of convicts and outcasts in his wake. This song to me was one of the greatest disappointments. The Gunns did not do enough to breathe life into such distinctive lines as “Vermin eaten saints with moldy breath.” And there was a big misstep in the text, “Big voiced lassies made their banjoes bang,” where “bang” was repeated in a percussive, forceful manner that suggests an explosion, rather than the kind of bang when the strings of a banjo are slapped. To be fair, in the moment of transfiguration, the repeated phrase “round and round (the mighty courthouse square)” was inflected and varied appealingly, and Mrs. Gunn’s “Hallelujah” exclamation jarred in just the right way. But on the whole, as in the Schumann, the song was delivered with only hints of how rich and strange it can be. Before the final set of four excerpts from William Bolcom’s Cabaret Songs Mr. Gunn, related amusing anecdotes about performing cabaret at the Carlysle Hotel. And there was nice color and flavor in the “Song of Black Max,” though the performance lacked that teasing, evocative quality that a team like Dawn Upshaw and Gilbert Kalish bring to this chestnut. “George,” a song of a drag queen male soprano, was better, delivered with tux jacket unbuttoned, a slightly drunken stagger to Mr. Gunn’s normally square-jawed stance, and a surprisingly credible soprano-register delivery of the words “Un bel di vedremo.” “Murray the Furrier” and “Over the Piano” were delivered decently, though the best part of the second half may well have been the encore, a stirring rendition of “Brother, Can You Spare a Dime” that taps into the contemporary rage of the disenfranchised 99%. Mr. Gunn moves on to Dallas for Dominick Argento’s The Aspern Papers at Dallas Opera, and he and his wife will present their next recital at the University of Notre Dame in May. The Celebrity Series’ next classical presentation will be a solo recital by Jonathan Biss, exploring more of Robert Schumann and his legacy, at Jordan Hall next Friday night.